The Merida Mexico Temple is the 92nd operating temple of The Church of Jesus Christ of Latter-day Saints. The building of the Merida Mexico Temple was announced on September 25, 1998. It is one of twelve Mormon temples in Mexico. A groundbreaking ceremony and site dedication were held on January 16, 1999 with Carl B. Pratt, a member of the Seventy and President of the Mexico South Area, presiding over the dedication and ceremony. The site of the temple is 1.53 acres on the north end of the Yucatan Peninsula, near the Gulf of Mexico. The area is rich with history and the temple site is close to some of the most famous archaeological ruins, such as Uxmal and Chichen Itza. The Mormon Church also has a rich history in the area. In 1875 at a General Conference of the Church, six missionaries were assigned to open a mission in Mexico. The assigned Mormon missionaries began traveling by land to Mexico and arrived on January 7, 1876. Missionary work started in El Paso del Norte and Chihuahua. In 1880 Mexico was blessed and dedicated so that the missionary work would go forward. Missionary work did progress in Northern Mexico at a great rate, but it was not until February 5, 1959 that the first missionaries arrived in Merida. The first Sunday service was held the next day with eight people in attendance that wanted to learn more about Mormon beliefs. On April 14, 1959 Raquel Pech was the first person to be baptized in Merida. By 1968 the first chapel was dedicated. This first chapel has since been torn down for the building of the temple. Today there are more than 13,000 members just in Merida and many more members throughout the area that will benefit from having a temple so close. 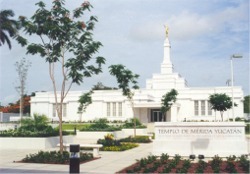 The Merida Mexico Temple was open for tours to the public June 24 through July 1, 2000. Those who toured the 10,700 square foot temple were able to see the two ordinance rooms, the Celestial room, two sealing rooms, the baptistery, and learn more about Mormon beliefs. Thomas S. Monson, a member of the First Presidency of the Mormon Church, dedicated the temple for use on July 8, 2000. Four sessions of the dedication were held which allowed more than 5,400 members to attend the services. The Merida Mexico Temple will serve 33,000 members in nine stakes and six districts in Mexico and Belize. This page was last edited on 8 December 2010, at 19:42.